The sky was blue and the ocean was sparkling for my Sunday excursion with NJ Wild friend Carolyn Edelmann over Labor Day weekend. She’s been raving for years about Bahrs Landing restaurant, right on the water with spectacular views and a big dock where you can pull in to fill up your tank – yours and your boat’s! It is located in Highlands/Sandy Hook, tucked in back of the very dramatic new $128 million Highlands bridge. You may think it crazy (traffic-wise) to plan a one-day shore area excursion over Labor Day weekend, but Sunday is kind of an in-between day and traffic was light throughout our trip. 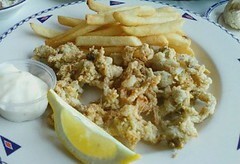 I was thrilled to have my favorite shore dish, fried belly clams (above). These were outstanding, very light and delicate. 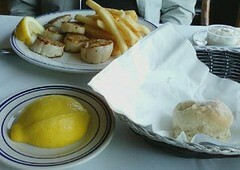 To the left, you see Carolyn’s scallops, pan seared to order (usually they are broiled or deep-fried.) Our entrees came with feather light biscuits, too, you see the last one in the basket in front of the scallops. Also, note the extra lemon wedges, no miserly little slices here. Usually lunch would be followed by a visit to Sandy Hook Park, but our time was limited, so instead we headed for stop # 2 – Sickles Market in Little Silver, another foodie destination I’d heard about for years. If I’d been hungry when I walked in the door, I’d have been in real trouble; as it was, I was just in moderate trouble. Excellent almond croissants, a nice little quiche, whole-grain mustard and caramel sauce….Jersey peaches and corn, stinky cheeses, some Rick Bayless Mexican Mix Granola – yes, really – it contains puffed amarenth, honey, peanuts, pumpkin seeds, cinnamon and cacao nibs. Should be interesting. Over the years Carolyn has shared some wonderful destinations with me; her passion for New Jersey’s great outdoors (especially birds) is wonderful! Carolyn, THANK YOU!